Soundim barrier can be furnished with a mesh located to one or both sides of the element. The mesh will make it more difficult either to damage the actual elements or do graffiti on them. There are three different materials used for the structure: Aluminum, steel and insulation made from recycled PET. Everything can be recycled without special measures. When needed, the whole structure can also be removed and used in another location. From environmental stand point the economic lifetime of the barrier can be over 50 years and there is no risk of contamination to the environment during the lifetime. Considering all the above, this is safe and sound solution! In Finland you can’t design structures without taking snow as a factor. 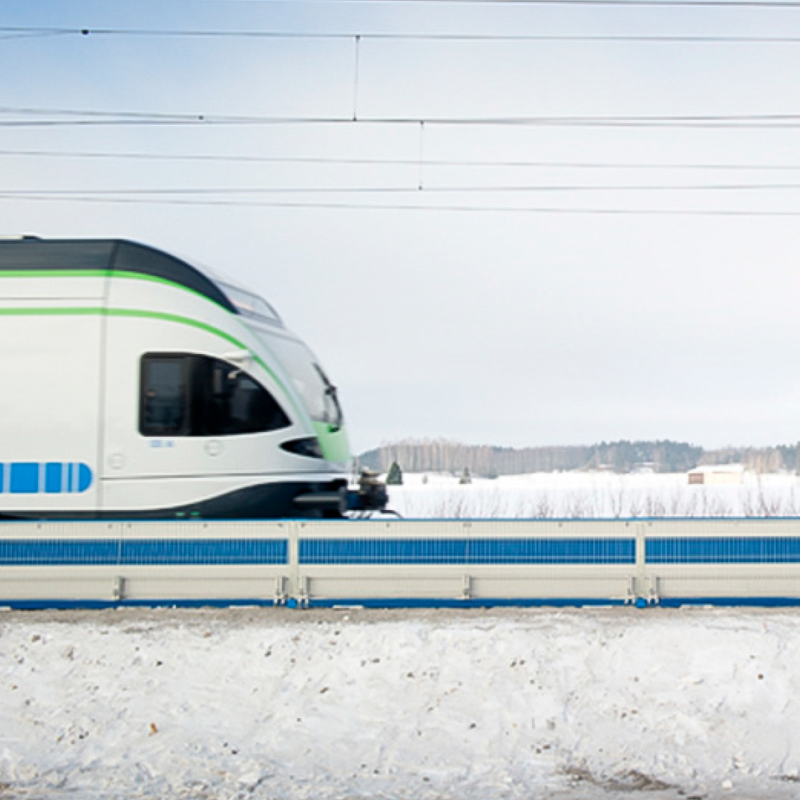 We have experience of winter conditions from actual installations in Finland since 2011. Based on our findings snow doesn’t cumulate between the barrier element and the track as the air flow caused by the passing trains typically clear the track zone. In case the snow removal is needed it can be done with snow blower taking the snow over the barrier. A cable channel is integrated to the structure. The base of the barrier acts as the bottom of the cable channel and the actual barrier elements as the top of it. When needed, cable channel can be accessed by tilting the elements. Any cable entry or exit to the channel can be machined in to metal base profile. With this integrated cable channel, you can run cables even on structures like bridges. 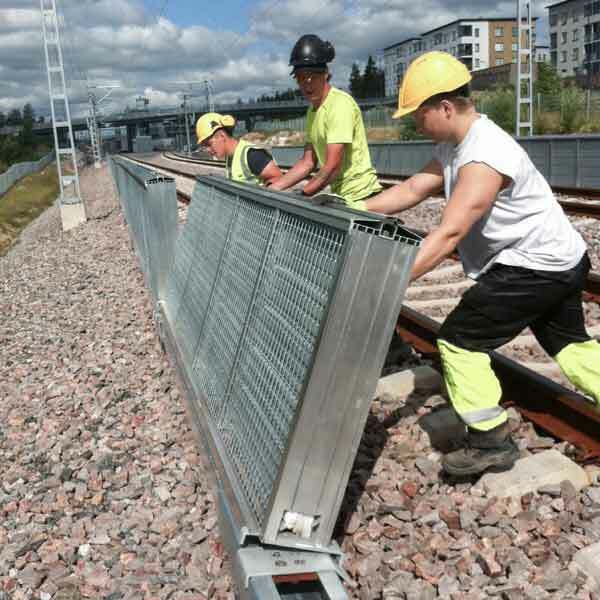 There are simple steps to install the Soundim noise barrier: Install the fixing poles, connect the pile heads and the base for the barrier to the poles and fix the barrier elements on top of that with bolts. It sounds easy – and it is. In fact, the installation can be performed even without operation stops at the track. Additionally, as a 4-meter element weight about 240 kg and 2-meter element only 150 kg, the clever design and light weight of the structure are major contributors to the ease of installation. 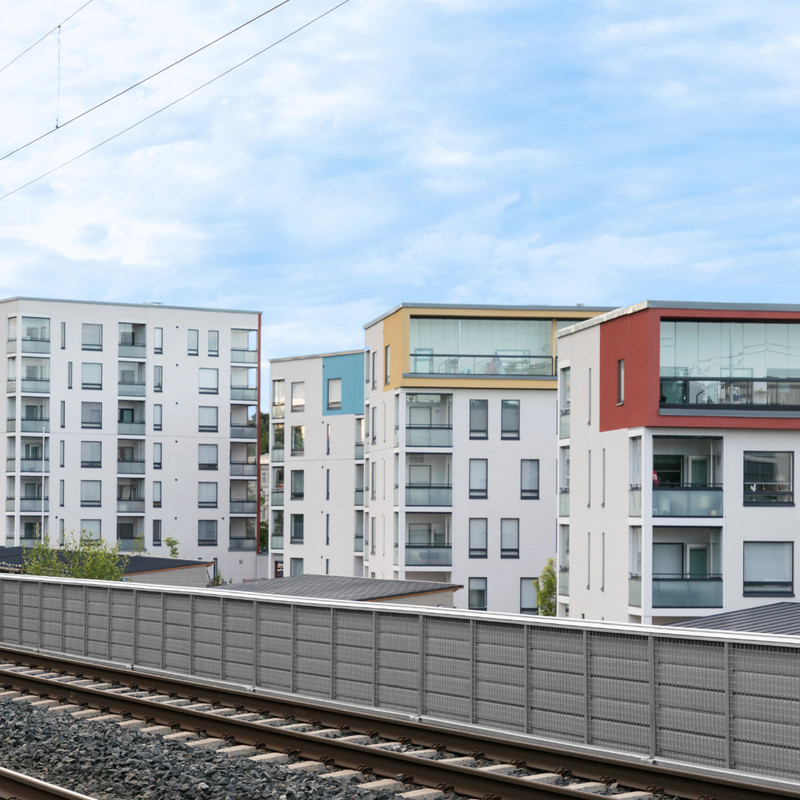 Soundim noise barriers require no separate foundation as barrier is fastened directly into track bed with fixing poles. 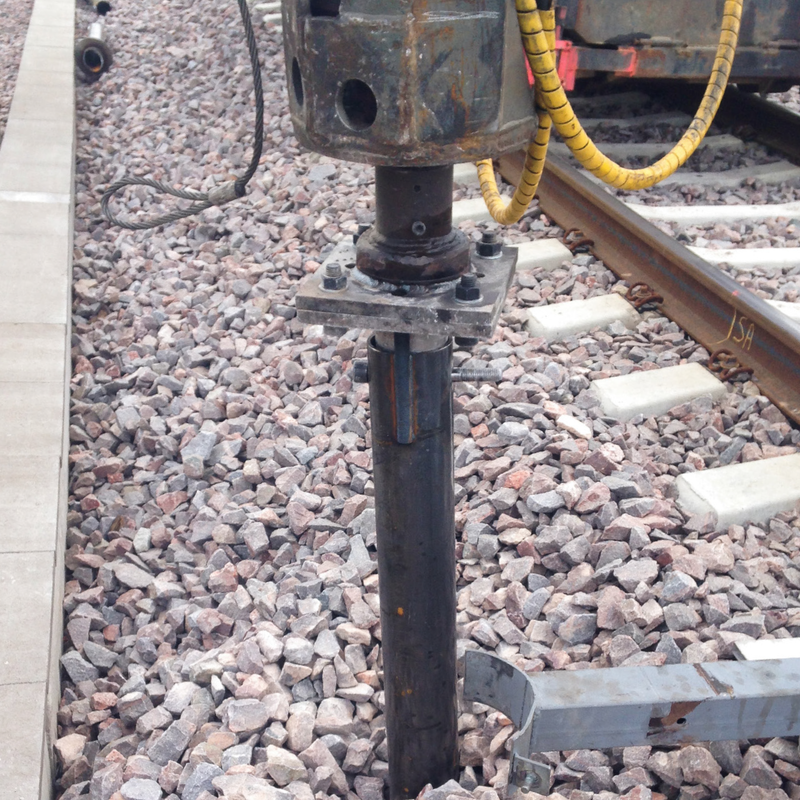 These metal poles can be installed even with light weight drills. The poles are installed with the same interval as the barriers. When needed, the interval can be adjusted according to the ground conditions. 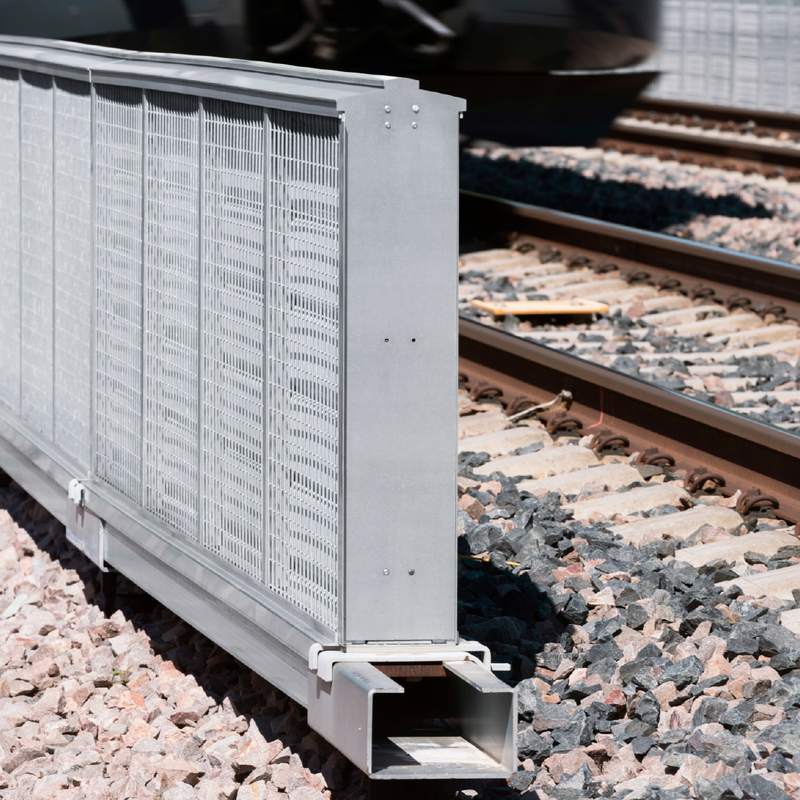 As the barrier is installed at track bed, there is no need to acquire land from outside of the track zone nor investigate ground conditions for the noise barrier. This saves both time and money in a project. 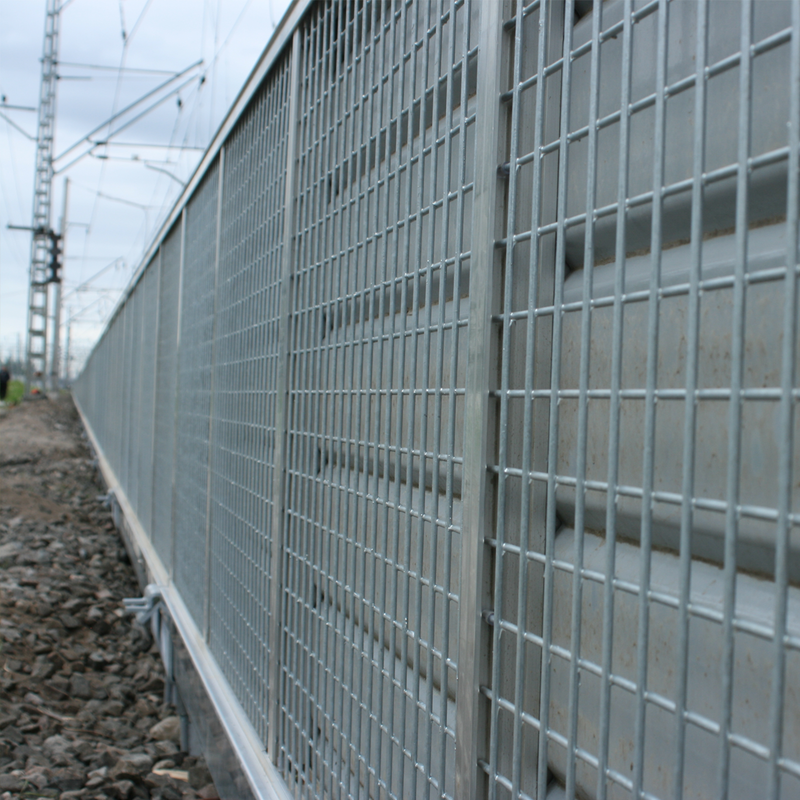 Even when noise barrier is situated close to rail, the track still needs to be operated and maintained without compromises. Many railway operators require that the track is free of obstacles in case of extra wide cargo for maintenance procedures. In these situations, Soundim patented barrier solution can be lowered to avoid removal. The barrier elements can be individually lowered or even removed if needed. 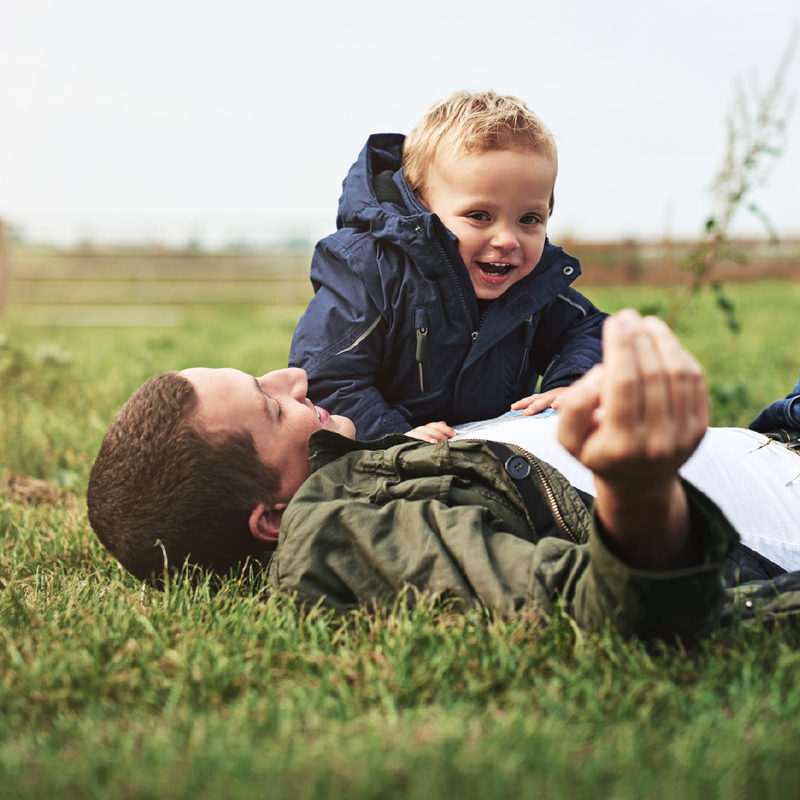 We may not know all your future needs regarding the maintenance, but we won’t stand in your way. In our living environment we value open space and unrestricted scenery. Also as passengers, we like to look and observe the landscape. When designing solutions to prevent railroad noise, we are not eager to compromise those values. With Soundim solution we don’t have to. Soundim low height noise barrier blocks the noise, not your view. As people can feel differences of sound changes in range 2-3 dB we are sensing twice as much noise, when the increase reaches 8-10dB. 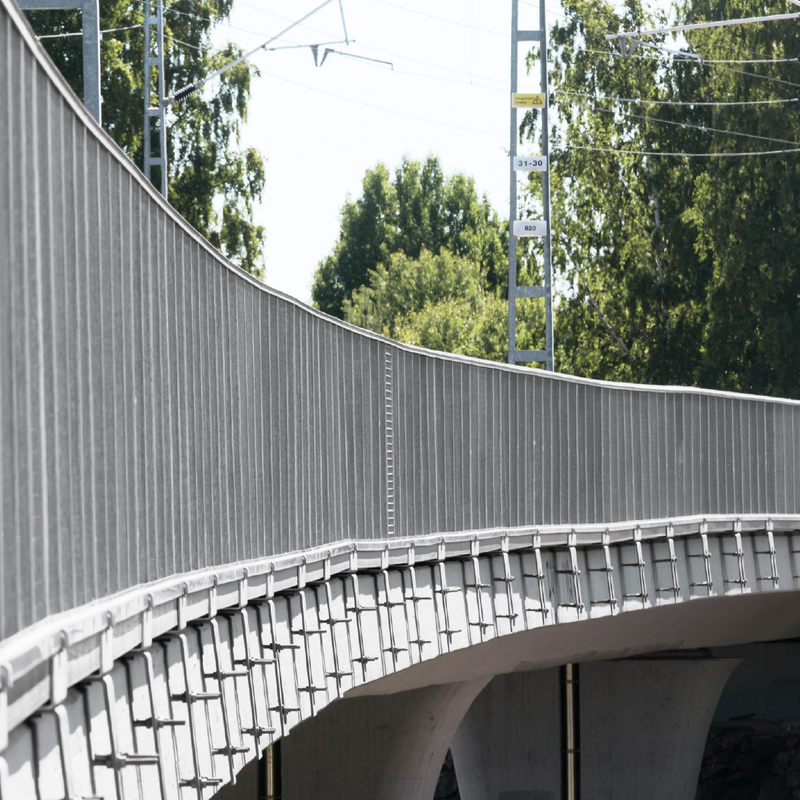 Soundim noise barrier is designed to reduce the noise at least to half, especially high frequencies which are considered to be the most disturbing. 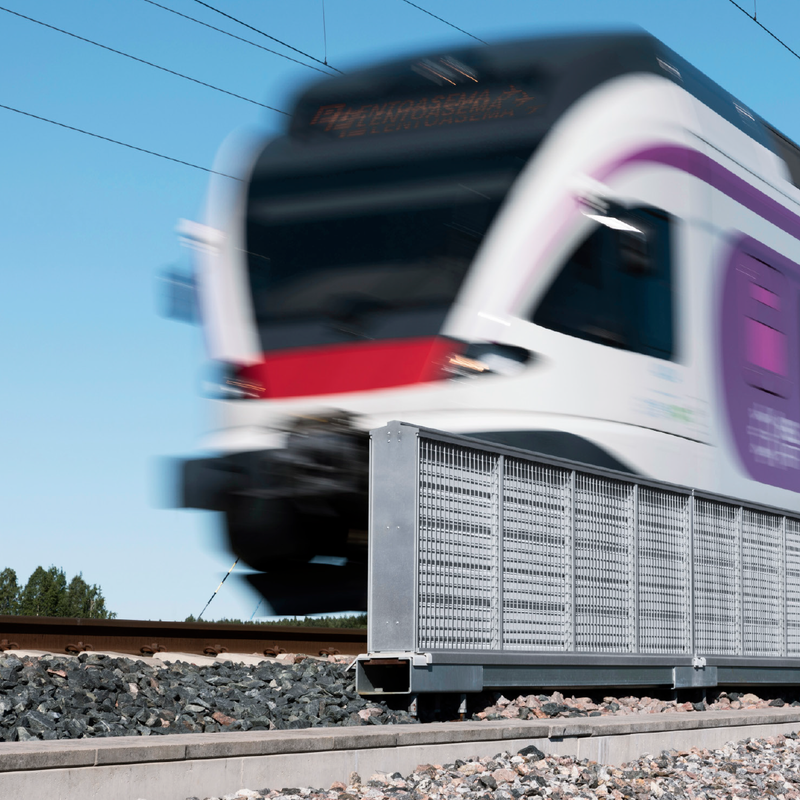 The total noise reduction depends on factors like train speed, track conditions and type of train. Noise absorption 13 dBA (Class A4), EN 1793 2, EN 1793 3. Noise insulation 30 dBA (Class B3), EN 1793 2, EN 1793 3. Total noise reduction up to 12 dBA, SFS-EN ISO 3095. Installed height only 850 mm from the top of the rails (standard model). Base of the barrier includes a cable channel. Metal mesh on main surface to prevent vandalism (optional).